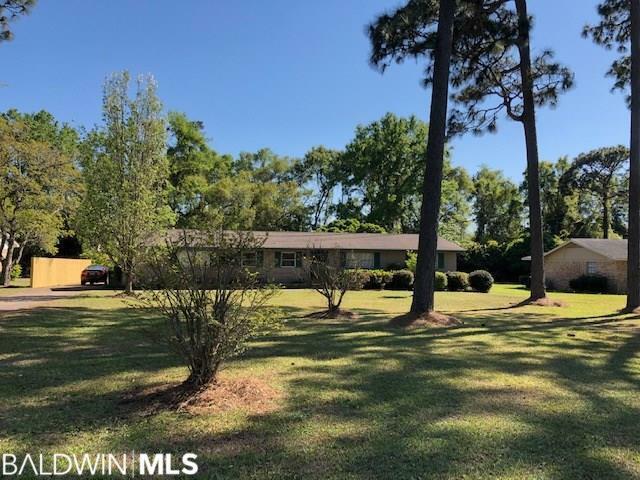 Come imagine the possibilities for this great ranch-style home on a huge level double lot with beautiful azaleas, fruit trees, and roses. Inside you&apos;ll find 3 bedrooms/ 2.5 baths, tons of natural light from the large picture window in the living room, two dining spaces, and a separate den with built-ins. Just out the french doors you discover the incredible covered patio surrounded by built-in planter boxes, and connected to the double carport. Not located in a neighborhood, and just 1.5 miles to the heart of beautiful Magnolia Springs, and minutes to Foley shopping and restaurants. Directions: From Hwy 98 And Hwy 59, Go West On Hwy 98 For 4 Miles. Home On The Left.